It always feels so good to know that I had a productive day, especially when I'm on a tight schedule to get this quilt made and other projects completed for the holidays. I feel today was one of those days. By last night, I had completed 1 or 4 columns of the center of the quilt. I pinned it to Bertha, my dress form. I completed the remaining 3 columns of 3 quilt blocks and 4 strips of rectangular panels. Following the instructions, I was now moving on to the next stage of the quilt, creating the sashing that will be added between each column, and at the top and bottom of the columns to create the finished "Center" of the 75x80 quilt. I like to conserve thread. It can get expensive. So, I decided to make all 5 sashes needed to complete the center of the quilt, and make them all at one time. Beginning with placing 1 small square, right sides together, against the long rectangular sash, and doing this 5 times. I clip apart the pieces when finished with my run, and press them open. I repeat this process until all 5 sashes were complete and pressed. There ya go! All done with my sashes! Now for the fun part! 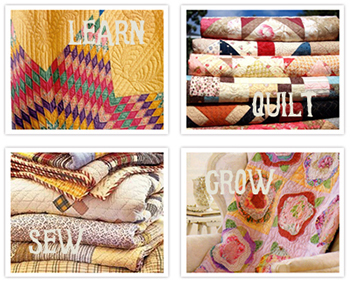 I get to add these to my quilt block columns that are pinned to Bertha! The quilt is beginning to take shape! After sewing a sash onto one column of quilt blocks, I pressed all the seams open. Then pinned on another column, then another sash, then another column, etc. And, as of right now, this is where I am at. I still have to sew on one more quilt block column and one more sash to the bottom and the center will be done! It looks beautiful! I'm so happy I decided to make this quilt for my mother. I know she will cherish it. Hope you are enjoying the progress I am making on this quilt! 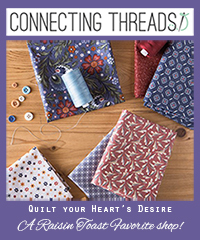 Be sure to go to Connecting Threads to see what other wonderful quilt patterns and quilt kits they have available to make!